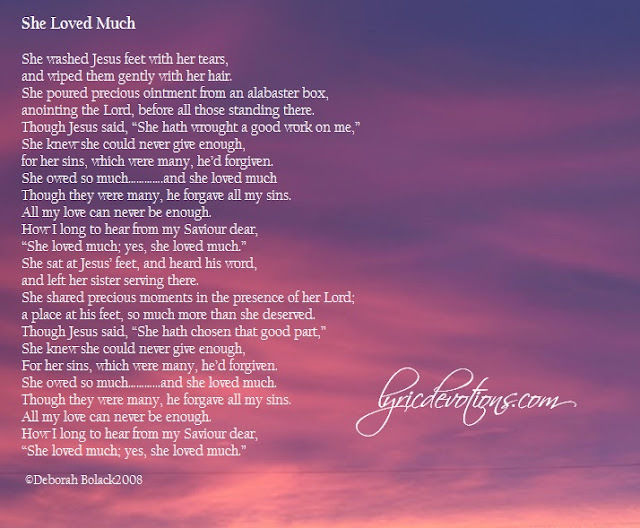 I read these accounts....of the woman washing Jesus' feet with her tears, of the woman sitting at Jesus' feet..... and imagine how wonderful it must have been to be in the presence of Jesus; to sit at his feet, and to hear him speak. But then I realize that I have that same privilege. I may not be physically in the presence of the Lord, but I can still sit at his feet in worship, I can still hear him speak through his word, and I can show my love for him by serving him until the day I see him face to face. Oh to hear those words, “She loved much.”! 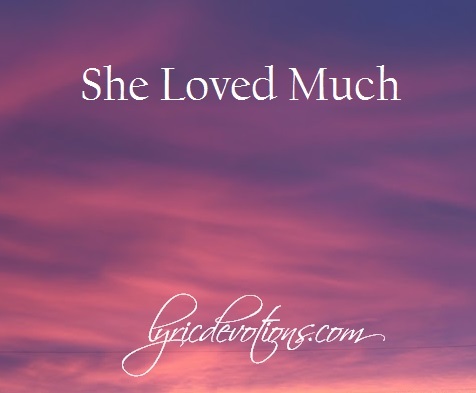 “She loved much; yes, she loved much." Luke 10:38,39,40a,41,42 Now it came to pass, as they went, that they entered into a certain village: and a certain woman named Martha received him into her house. And she had a sister called Mary, which also sat at Jesus’ feet, and heard his word. But Martha was cumbered about much serving, And Jesus said unto her, Martha, Martha, thou art careful and troubled about many things: But one thing is needful: and Mary hath chosen that good part, which shall not be taken away from her.